Are garnet gemstones behind the case of Earth's missing iron? What makes the Red Planet red? The answer, as Sherlock Holmes might say, is elementary. And that element is iron. The continental crust of Mars is so iron-rich that, over billions of years, surface rocks actually rust when exposed to the meager oxygen in the planet's atmosphere. The result is a rust-coated planet that appears red, even from Earth. Earth might rust, too, for that matter, if just a fraction more iron was present in the planet's continental crust. But something, deep underground, is stealing Earth's iron. "The accepted wisdom is that magnetite pulls iron from the [magma] melt before the melt rises and gets erupted out at continental [volcano] arcs," study author Ming Tang, an assistant professor at Rice University, said in a statement. "Iron depletion is most pronounced at continental arcs, where the crust is thick, and much less so in island arcs, where the crust is thin." If magnetite was sucking up iron, then, you would expect magnetite to be more plentiful where the continental crust was thicker, and iron depletion correspondingly greater. But the thickness of the crust doesn't correlate with levels of magnetite. But garnet abundance, the authors said, does correlate with crust thickness. Almandine — an iron-rich variety of garnet — forms best under high-pressure, high-temperature conditions. Conditions like these are common below the land-based volcanoes that form at continental margins, when dense oceanic crust slides beneath continental crust. 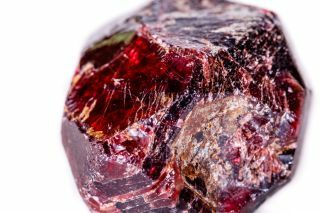 With garnet more plentiful below such volcano chains — known as continental arcs — and iron less plentiful there, the researchers saw a correlation worth studying further. Of course, fishing rocks up from molten pools many miles below an active volcano is not easy, so in studies like these scientists tend to rely on the ancient rocks that have already been spewed out by past volcanic eruptions. Rocks like these are known as xenoliths, and can reside up to 50 miles (80 kilometers) below the Earth before being ripped apart and scattered in a volcanic eruption. These rocks provide researchers with "a direct window into the deep parts of the continental arc," study co-author Cin-Ty Lee, a geologist at Rice University, said in the statement. In the new study, Lee and several students embarked on an excursion to collect xenoliths from southern Arizona, which were spewed by an ancient volcano millions of years ago. Analysis of the xenoliths showed that these rocks formed below a continental arc, and were indeed laden with garnet. To further test the correlation, the researchers spent several months examining xenolith records in the Max Planck Institute's GEOROC database, which contains comprehensive information on volcanic rocks collected all over the world. They found that, true to their hypothesis, magma that included more fragments of garnet were also more iron depleted. "This is born out in the global record, but the evidence is something that wouldn't be obvious from looking at just one or two cases," Tang said. So, is garnet the great iron thief lurking in Earth's crust? Further study is needed to say for sure. But at least now researchers have their eyes on one more likely suspect.